Paralyzed Vietnam Veteran Michael M. Bruscino participates in the Veterans Day memorial services at the Vietnam Wall as part of the Lone Star Paralyzed Veterans Association Honor Guard. 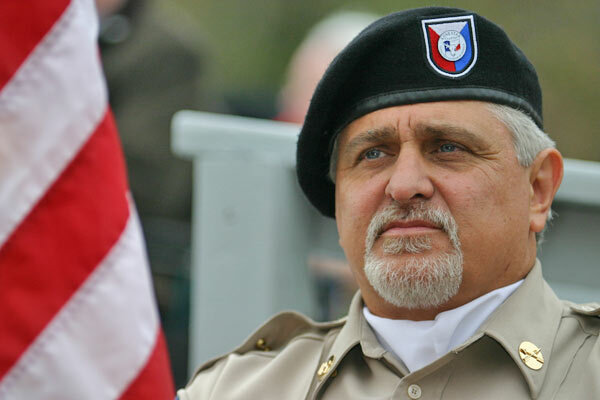 November 11, 2003 - Paralyzed Vietnam Veteran Michael M. Bruscino participates in the Veterans Day memorial services at the Vietnam Wall as part of the Lone Star Paralyzed Veterans Association Honor Guard. Mr. Bruscino served in Vietnam with the U.S. Army as a member of a Special Forces team of combat engineers. He was wounded in action on August 12, 1969, while on patrol in a battle near Camp Mi Loc. Bruscino is originally from Amarillo, TX, and now lives in Keller, TX. He is 54 years old.